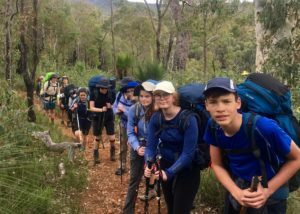 The 5 Day Three Peak Hike was designed specifically for young people & Duke Of Edinburgh Award and ran over the recent school holidays. 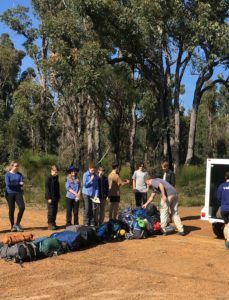 We began our journey south at the Brookton Hwy / Bibbulmun Track intersection. Ending at the Three Ways Tavern in North Bannister 76km away. 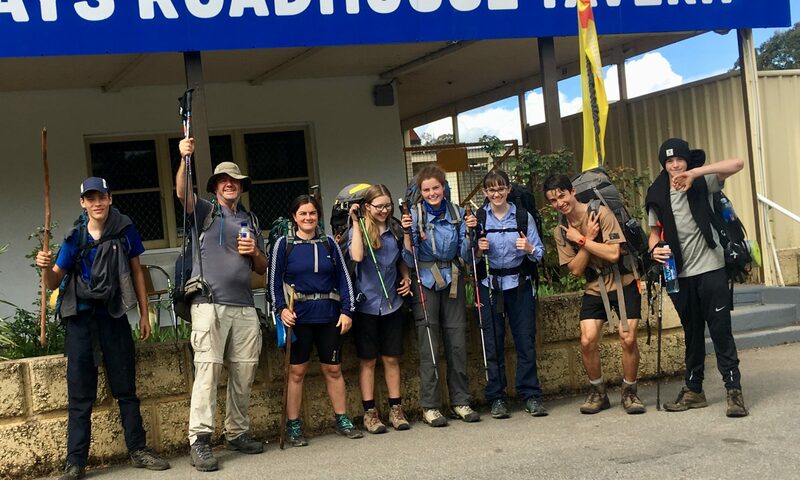 The hike was made up of nine teenagers between 13 and 17 years old and three guides including myself. 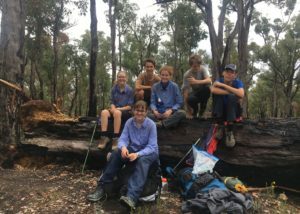 Seven of the hikers were participating to complete a level of their Duke Of Ed Award. Duke Of Ed requires groups not to be more than seven participants, so I split the five girls and four boys. Prior to the hike I met with most face to face and a few over the phone. 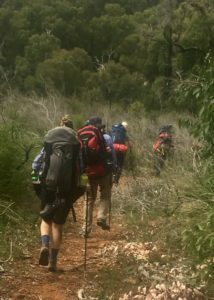 Then a week prior to the start we all met up to do a pack shakedown to go through their packs to keep their weight as low as possible. A bus from Landsdale Bus Charter picked us all up at the Cockburn Train Station as this was central and easy for parents to reach. I thank small business owner Neville from Landsdale Bus Charter for his professional and friendly service. He played his part in making this hike great. We arrived at the trailhead 9am, not too early as our first day was deliberately only 8.5km to the Canning Campsite. We all sat in a circle and discussed expectations. A plan for the day and things I wanted to incorporate immediately. 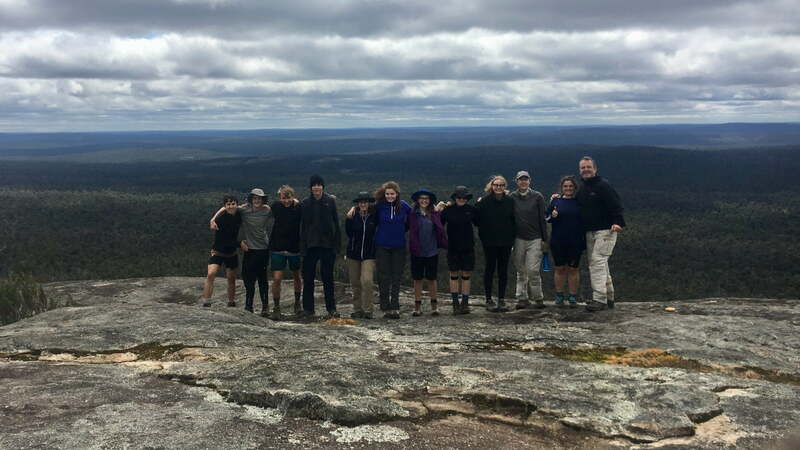 Most of the teens had no or little hiking experience so I knew this hike was going to challenge them, but I also knew they could do it. I know they were going to complete something new and amazing. I told them hiking is 90% mental. I had three ideas I wanted to incorporate into the hike. 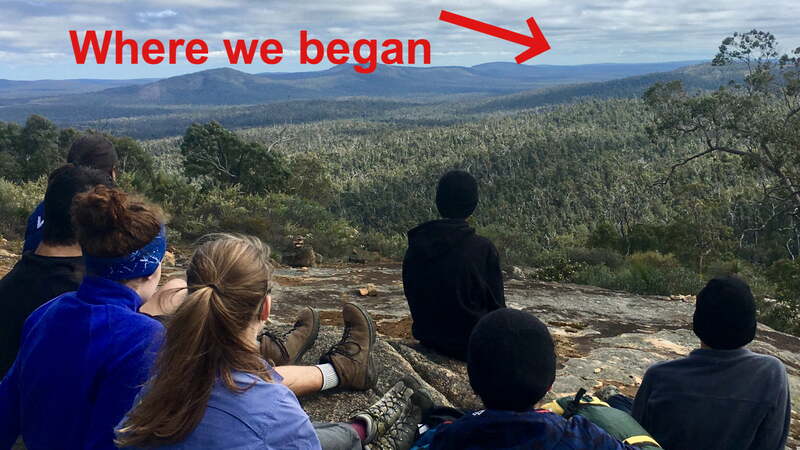 The Leave No Trace principals, Hike Your Own Hike and Mindfulness. Rather than sitting down and discussing them like a class I subtly brought them in during the day when they matched something we were doing. The first day was all about feeling. Feeling our bodies during the first 8km, our backs, legs, hotspots to prevent blisters. Feeling our packs and adjusting them. We stopped often for one reason or another but that was good, I was encouraging them to speak up for themselves. One of the hip belt straps snapped in the first hour haha, my guide Tamika had a spare strap that she was able to adapt to his pack. Some of their packs were quite heavy, over the recommended pack body weight ratio. How quickly they adapted to hiking with a pack really surprised me. We did place a big emphasis on wearing the pack correctly. I have never been an ultralight gear hiker, even if I could afford them I still wouldn’t. It is more important to have the right gear and wearing it correctly than the weight. 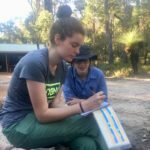 When we arrived at the campsite I explained to them the importance of filling in the campsite log books for any required evacuation and for track statistics. The other way we all adapted very quickly was socially. Four of the girls were friends and came from the same school. The rest were all from different schools and there was up to a 4-year age difference, they inspired me. I never intended to have ice breaker activities, I just let it all blossom naturally. I brought in Trail Names, to encourage leaving their usual life behind. We were no longer our names, ages, school or expectations. The Trail names quickly became a fun and favourite topic of conversation. They ranged from Salad because his hair was styled like a lettuce leaf to Shapes because he had a different flavoured box of Shapes for lunch each day. Nutz because she loved eating them and Pink Panther. Llama, Wren, Snood, Sniff which started as an actually sniff but I explained that this would be hard to write in the log book haha. Sly Fox only 13 and most experienced hiker in the group. He has now hiked about 230km with me. Day two almost doubled the km we walked on day one. It was flat and included a virgin jarrah forest and many wild flowers. We ironed out pack and feet issues before we left. We only stopped a couple of times for blisters and the planned breaks. I brought in a mindfulness and mind over matter activity by suggesting we walk the last few km in bare feet. This proved to be a big challenge to all of us, especially from the gravel under our feet. I did not mind the ones who chose not to participate or who did not complete it. Speaking up for yourself and hiking your own hike was just as important. I even told them that they could put their boots back on and the reply I received was “No way! I’m going to do this” I remember at one point Nutz passed me and said “I’ve decided that the slower I move the longer it will take” About seven of us completed it, we were all very proud of ourselves and celebrated with high fives. We arrived at the beautiful Monadnocks campsite. A campfire was already going, started by a family also staying in the shelter. We never planned to stay in shelters, we enjoyed our tents. Day Three brought us a double climb of Mt Cuthbert and Mt Vincent, the most challenging day mentally. Some found the climbing difficult, but I told them that we knew 100% that their legs could do it, we were having enough breaks, so it was a mental challenge, a change in attitude towards it. We witnessed an adult Dugite on Mt Cuthbert who had just caught a lizard for its breakfast, this was a highlight. The view from the top was as stunning as ever, we stayed an hour up there. We had fun taking photos, exploring the area and we did some mindfulness by sitting away from each other, in 10 min silence over looking forest below which seems to go on forever. 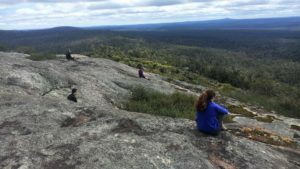 On Day Three at Sullivan Rock we said goodbye to three hikers and one guide Thanks Lou! Two were returning home as their hike was three days. Thanks Dennis (Uber driver and family friend) and a dad who picked them up. One of the hikers made the brave decision to ask to go home which I respect. A good hiker and life lesson is also knowing when enough is enough and be proud with your effort. We had a campfire every night, they became a special and an important part of the adventure. The campfires heated us in the cold, boiled water. We all sat around them which encouraged conversations, games and songs. Ticks became a part of our hike whether we liked it or not, they went from being annoying to a competition of who had the most, I won with about nine. On day four we were planning to stop for lunch on top of Mt Cooke but the wind gusts were so strong, it was almost blowing us over. Our way down from Mt Cooke we were being lead by members of the group, everyone had the opportunity to lead. I told them that if I noticed us going off track, I would not say anything. The group believed that we were on the track. It wasnt until a member stopped me and asked me if we were. I stopped the group and checked the GPS, I then announced to them we were off track. As a group we made decisions to get ourselves back on track. We chose to not turn back but to use the gps to head in a southerly direction where we would run into the track under large powerlines which we could also use a landmark. At around midday and back on the Bibb, I received a severe weather warning which I investigated immediately as I knew that soon I would lose all phone signal. Winds of up to 90km per hour were forecast for that night so I told everyone that we would all need to sleep in the shelter, not our tents. As it happened there was no severe winds and the night passed calmly. We shared the shelter with two other hikers, it was cosy and fun. Lots of snoring apparently. The final day was a 19km flat stretch to North Bannister where the Bibbulmun Track meets the Albany hwy. We arrived an hour early which shows you how stronger they became physically and mentally in a few short days. We relaxed at the roadhouse eating ice-creams and hot chips. Everyone who participated on this the Five day Three Peak Hike that made it as special as it was and I am eternally grateful, especially to Tamika (The Lorax) and Lou (Loulou) my two amazing guides and friends.